Victorian print. Approximate size of print If you like the item, but do not like the price. QUICK SALE AT A FAIR PRICE. (255mm X 210mm). This magazine employed talented photographers. An original page/pages (as pictured) from an issue of TheNAVY andARMY ILLUSTRATED. CONDITION . QUICK SALE AT A FAIR PRICE. THIS ITEM CONSISTS OF ONE OR MORE PAGES/SIDES. If you like the item, but do not like the price. An original page/pages (as pictured) from an issue of The ARMY and NAVY ILLUSTRATED. CONDITION . An original page/pages from an issue of The NAVY and ARMY ILLUSTRATED. If you like the item, but do not like the price. QUICK SALE AT A FAIR PRICE. SOUTH AFRICA & TRANSVAAL WAR - 1900. AND NOT A REPRODUCTION. EXCELLENT condition & rescued from a copy of. If you like the item, but do not like the price. This magazine employed talented photographers. CONDITION . An original page from an issue of The ARMY and NAVY ILLUSTRATED. QUICK SALE AT A FAIR PRICE. An original SINGLE PAGE from an issue of The ARMY and NAVY ILLUSTRATED. CONDITION . 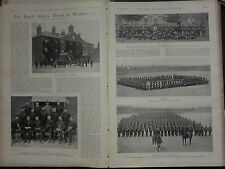 An original page/pages (as pictured) from an issue of The ARMY and NAVY ILLUSTRATED. An original page from an issue of The ARMY and NAVY ILLUSTRATED. If you like the item, but do not like the price. QUICK SALE AT A FAIR PRICE. CONDITION . If you like the item, but do not like the price. QUICK SALE AT A FAIR PRICE. An original page/pages (as pictured) from an issue of TheNAVY andARMY ILLUSTRATED. THE NAVY & ARMY ILLUSTRATED. THIS ITEM CONSISTS OF ONE OR MORE PAGES/SIDES. An original page from an issue of The ARMY and NAVY ILLUSTRATED. If you like the item, but do not like the price. If you like the item, but do not like the price. QUICK SALE AT A FAIR PRICE. An original page/pages (as pictured) from an issue of The ARMY and NAVY ILLUSTRATED. This magazine employed talented photographers. CONDITION . Printed on quality paper. QUICK SALE AT A FAIR PRICE. Provenance: The Transvaal War Album, The British Forces in South Africa. Newnes, London, Ca 1900. This is an authentic print, published at the date stated above. It is not a modern copy. May be signs of usage and handling to the page edges. This magazine employed talented photographers. An original page/pages from an issue of The NAVY and ARMY ILLUSTRATED. CONDITION . If you like the item, but do not like the price. To illustrate news and events. QUICK SALE AT A FAIR PRICE.
" 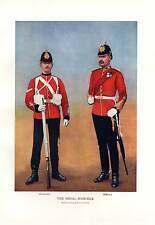 OFFICER INSTRUCTORS OF ROYAL MARINE ARTILLERY " 1896. 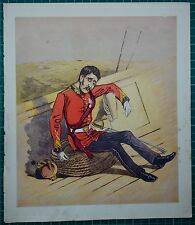 This is a Original Print Published for The Navy and Army Illustrated, London 1896.